When researching display tents for craft shows, answer these 6 questions to ensure you buy a canopy that is cost effective and fully meets your needs. 1. Does it provide adequate protection from the weather? If you will be doing outdoor shows, you'll need protection from sun, wind and rain. Not all canopies come with sidewalls, and if you're caught in a rain storm, you'll be happy to have them to protect yourself, your crafts and your customers. Sidewalls can also be useful to create shade when the sun is hitting your booth at an angle and the top of the canopy isn't completely shading your space. 2. Is the canopy cost effective? If you only plan to do a couple of outdoor shows each year, you might be able to get away with one of the less expensive craft tents. If you are seriously committed to making craft shows a significant part of your business strategy, then you'd be wise to invest in a more substantial canvas canopy. Remember that buying the least expensive item is not always the most cost effective choice. If you are doing several shows and you find that your bargain tent doesn't stand up to the wear and tear, you'll eventually end up spending even more money buying a better tent. Think carefully about the number of outdoor shows you'll be doing to determine how much to invest in a tent. Also, when you compare prices of display tents, notice which accessories are included in each of the different brands and models. Does the tent come with side walls included? How many? What type? Does the tent include a carrying case with wheels, or will you have to buy that separately? If you are careful to notice the accessories that are included with the canopy you are considering, you'll be able to do a better cost comparison. To make it easier to track different models that you are comparing, you can download a printable craft tent comparison chart here. 3. 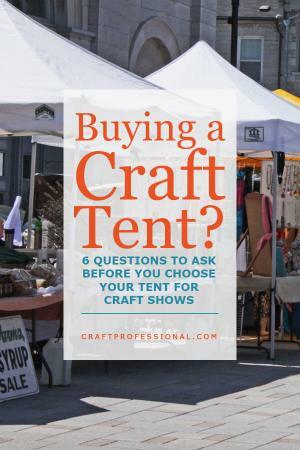 Is the craft tent portable? You'll put up and take down your canopy countless times and transport it to plenty of shows, so easy portability is an important factor to look for in a tent. Also, ensure that your canopy will fit in your vehicle. A wheeled carrying case will help protect your canopy, keep it clean, and make it easier to transport. A portable canopy can be fairly heavy, and a carrying case with wheels will make it much easier to transport your tent from your vehicle to your booth space. 4. Does your tent show off your work in its best light? Also, will your tent be accepted for use at all shows you want to participate in? Sometimes people are tempted to buy a colored canvas canopy, especially if they are on sale. Be very careful about choosing a craft tent that is not white. Colored craft tents will reflect the color of the canopy onto your display. A colored tent can make your booth dark and uninviting, and it can make it impossible for customers to see the true color of your pieces under the canopy. 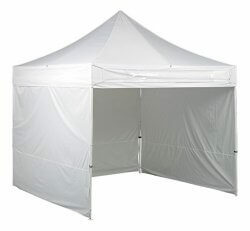 A white display tent will typically show your work to its best advantage. On top of that, some shows only allow white tents. You may be limited in the shows you can do if you choose a colored tent, or you may need to buy a second tent that is white to participate in certain shows. 5. Can you set up the tent easily, and by yourself? Sooner or later you'll need to do a craft show on your own. While it's a great idea to bring an assistant with you to craft shows, it might not always be possible. If you can set up the canopy yourself, you'll have a lot more flexibility in your ability to commit to shows without relying on outside assistance. 6. Is the display tent flame resistant? It doesn't happen all the time, but show promoters or local fire marshals can require proof that your booth is made from flame resistant materials. 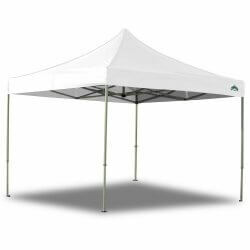 Ensure your canopy meets fire codes by checking the specifications before you purchase your display tent. 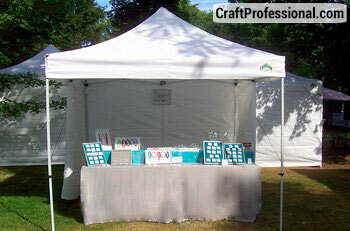 A quality canopy is a wise investment in your home craft business if you intend to sell your crafts at outdoor shows. My own tent is a Caravan brand canopy and I'm very happy with it. A lot of professional craft artists use EZ UP Canopies and say that they find this brand fits their needs as well. Not sure what tent is right for you? You can find a list of popular craft tent brands here. Why EZ Up tents are so popular at craft shows. 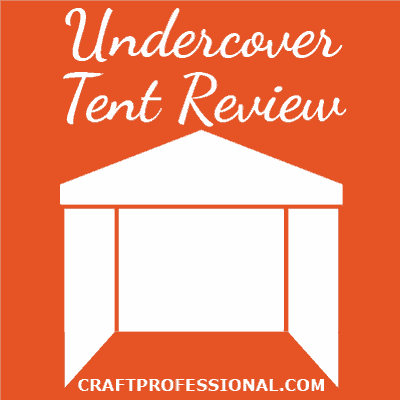 A reader shares why she loves her undercover tent. My craft tent is a Caravan Canopy. Here's why it's the brand I chose.